Executive Vice President, Atlantic Council, Washignton, D. C.
Damon M. Wilson is executive vice president of the Atlantic Council, where he is responsible for programs and strategy. His work is committed to advancing a Europe whole, free, and at peace; to strengthening the NATO Alliance; and to fostering a transatlantic partnership capable of tackling global challenges and promoting its common values. 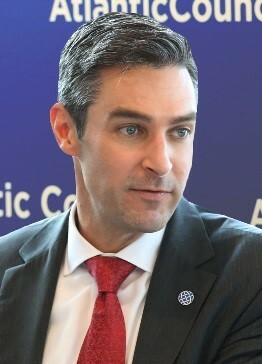 From 2007 to 2009, Mr. Wilson served as special assistant to the president and senior director for European affairs at the National Security Council. He managed interagency policy on NATO, the European Union, Georgia, Ukraine, the Balkans, Eurasian energy security, and Turkey, and planned numerous Presidential visits to Europe, including US-European Union and NATO summits. Mr. Wilson has also served at the US Embassy in Baghdad, Iraq as the executive secretary and chief of staff; at the National Security Council as the director for Central, Eastern, and Northern European affairs; and as deputy director in the Private Office of NATO Secretary General Lord Robertson. Prior to serving in Brussels, Mr. Wilson worked in the US Department of State in various positions dealing with European security and China and served in Rwanda with Save the Children. He is a graduate of Duke University, studied at the University of Grenoble in France, and completed his graduate studies at Princeton University’s Woodrow Wilson School for Public and International Affairs. Mr. Wilson also worked with the Unaccompanied Children in Exile refugee program in Croatia and Turkey, and has been decorated by the presidents of Estonia, Bulgaria, Georgia, Hungary, Latvia, and Poland for his efforts to advance transatlantic relations.